The Altadena Historical Society (AHS) was founded in 1935. We gather, preserve, and share print and digital information about the people, places, and events that have shaped the Altadena community. For more information, visit the AHS website or send us a message. This website was made possible by a generous grant from Southern California Edison. 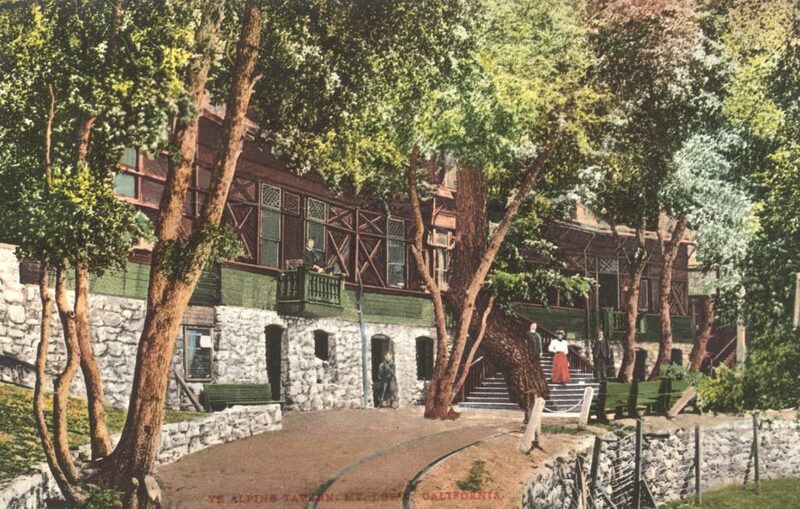 Ye Alpine Tavern (as it was first named), the fourth and last hotel built by Professor Lowe, welcomed over three million visitors in its forty-one years of operation. Opened in 1895, the resort was destroyed by fire in 1936. The skeletal ruins remained until demolished by the U.S. Forest Service in 1959. 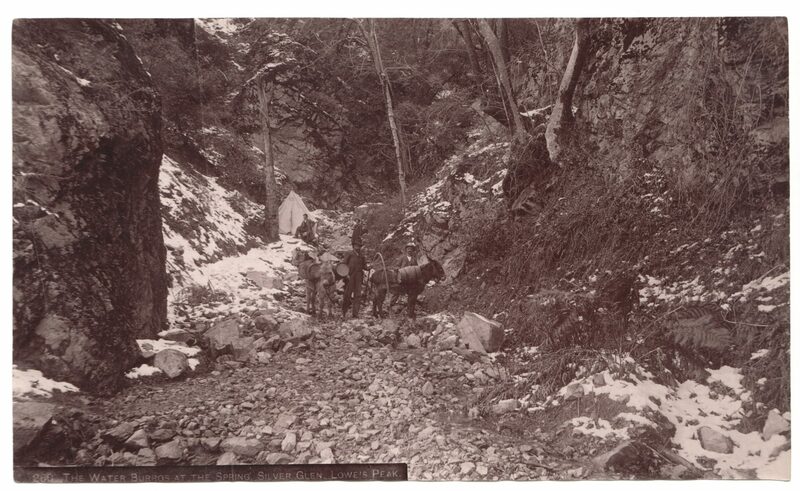 The site of the original Alpine Tavern, a popular destination for hikers, backpackers and Mt. Lowe Railway history enthusiasts, is now a U.S. Forest Service campground. Unfortunately, about the time the Alpine Tavern was scheduled for construction in 1895, Lowe’s heady dreams were putting pressure on his dwindling finances. 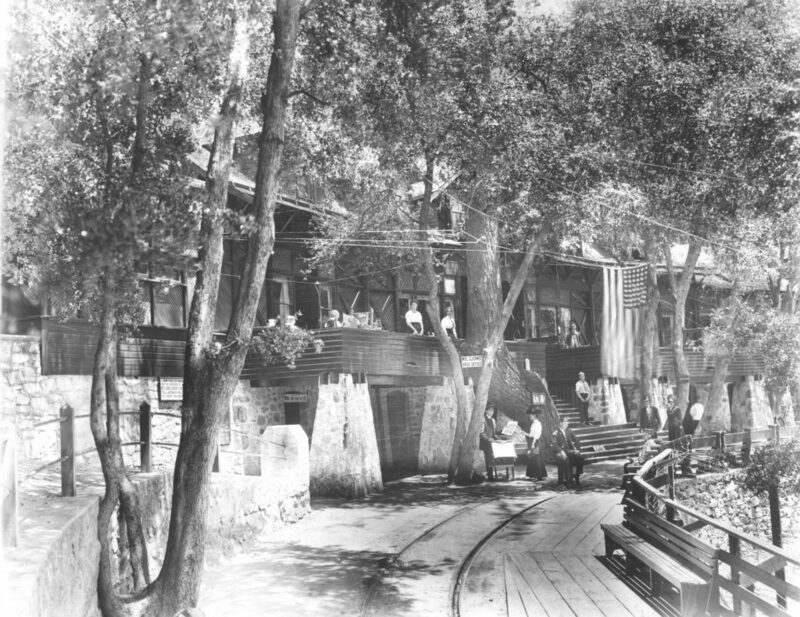 Due to the nation-wide financial reverberations from the Panic of 1893, as well as his own declining resources (he had already used his home and other businesses as collateral for loans), Lowe resorted to three creative methods to finance expansion – the bottling and sale of Crystal Springs water, the use of Tally-Ho coaches to collect Los Angeles hotel patrons and bring them to Altadena, and the creation of the Alpine Club. 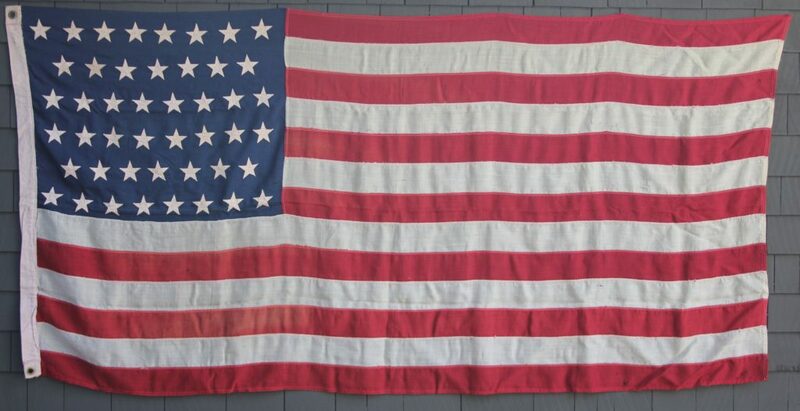 Why not offer his cronies/friends/colleagues, Los Angeles and Pasadena business men, an opportunity to purchase $1,000 worth of stock in exchange for the unlimited social and business use of his “new” Alpine Club? 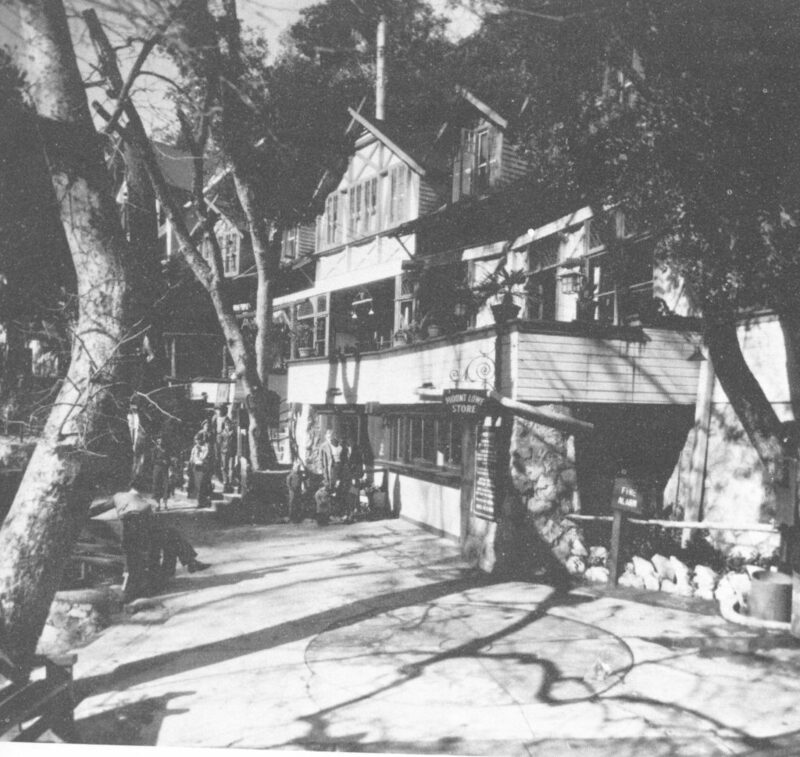 Lowe planned to build the Club House for about $5,000 and use the remainder to build Alpine Tavern. With 100 investors he would have plenty of cash to invest back into the resort. 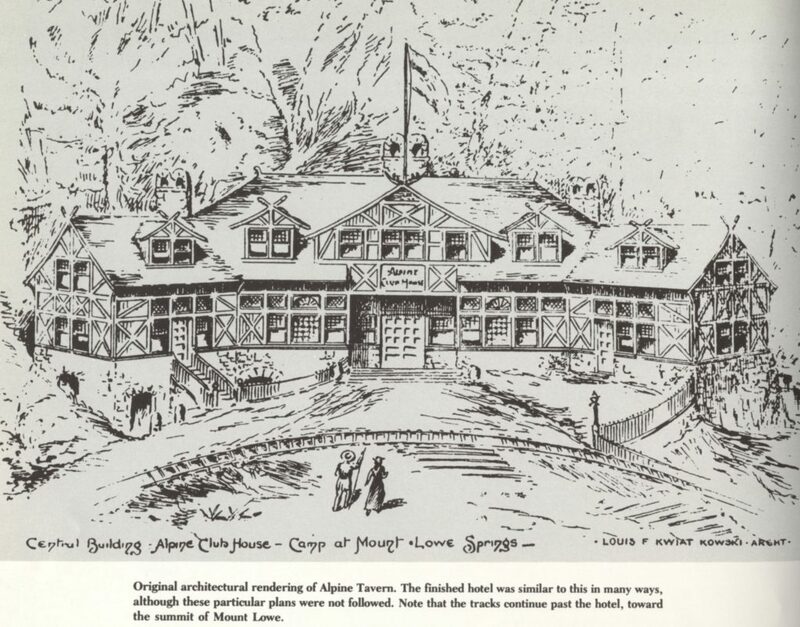 In reality only about 30 members joined the Alpine Club, so a facility was never built, but members did have exclusive privileges at the Tavern. Construction of the tavern began in August 1895, and for over sixty days, the Alpine Division cars transported building materials to the site, a narrow flat area surrounded by trees, abutting the granite of the San Gabriel Mountains. 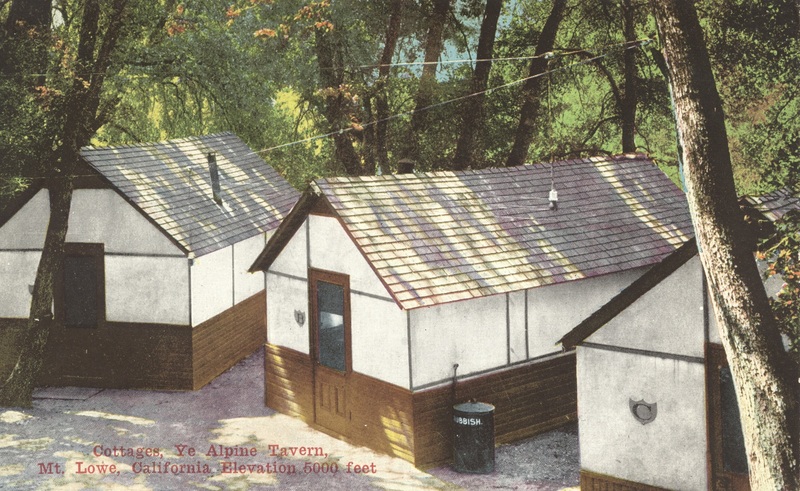 The Alpine Tavern, designed by Pasadena architect, Louis Kowski, became a compact, two-story Swiss-style chalet. 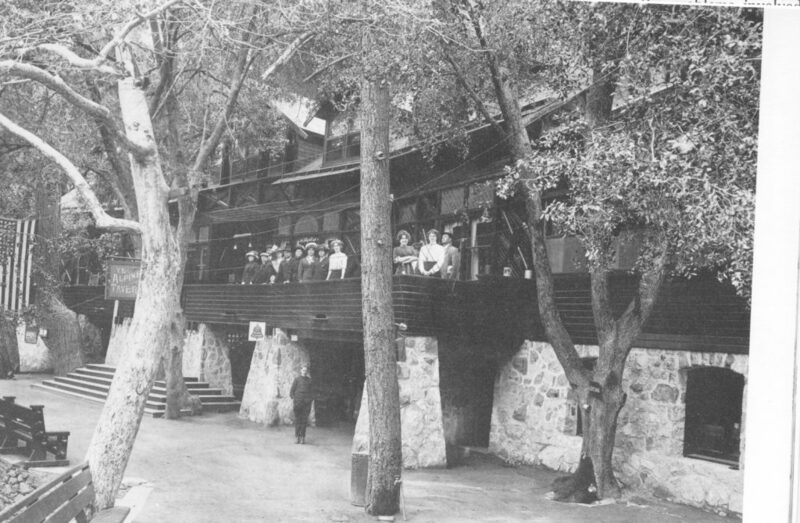 Constructed of granite from the Crystal Springs area and Oregon pine logs, Alpine Tavern emerged as a structure with twelve sparsely furnished bedrooms on the second floor, a billiard room in the basement, a dining room on the first floor that could accommodate 100 guests, a lobby and five fireplaces. 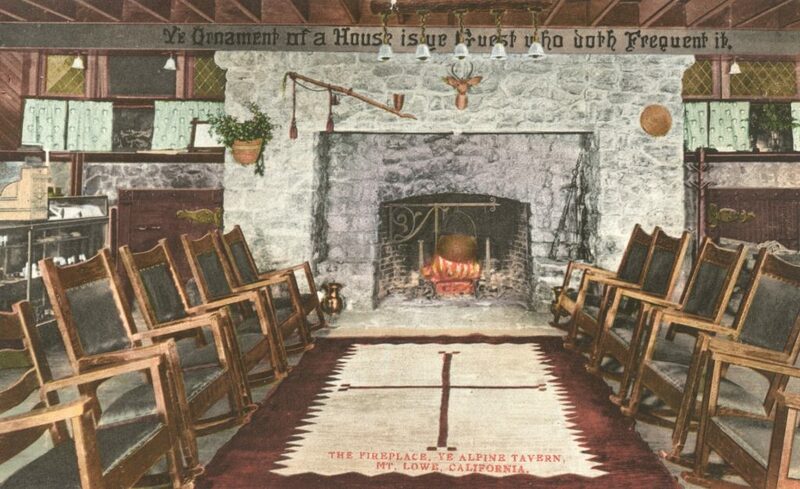 The main stone fireplace, pictured in classic postcards, measured 12 x 7 feet. 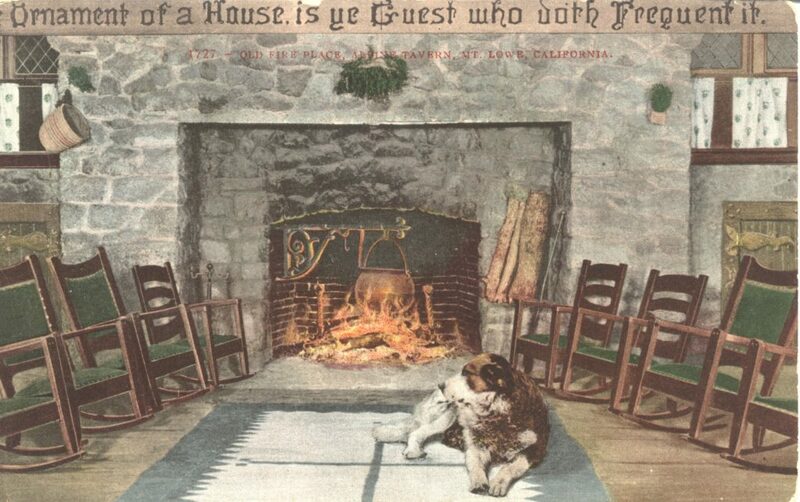 The Willamette Lumber Company donated the carved wooden plaque which hung above the fireplace which said “Ye Ornament of a House is Ye Guest who doth Frequent It.” Electricity and hot water provided comfort for the guests. Tent cabins and camping were available for guests desiring a more rustic experience. Construction was completed on Nov. 2, 1895 at a cost of $45,000. 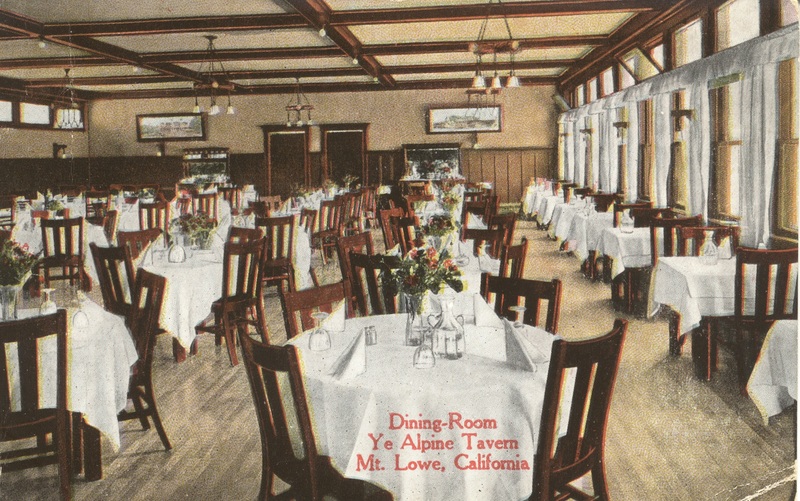 Lowe could always create a moment of ballyhoo to publicize his latest venture, and the dedication of Alpine Tavern, to which he invited over 100 friends and dignitaries such as Ulysses S. Grant, Jr., members of the Alpine Club, members of the Los Angeles Chamber of Commerce, and members of the press, proved to be no exception. 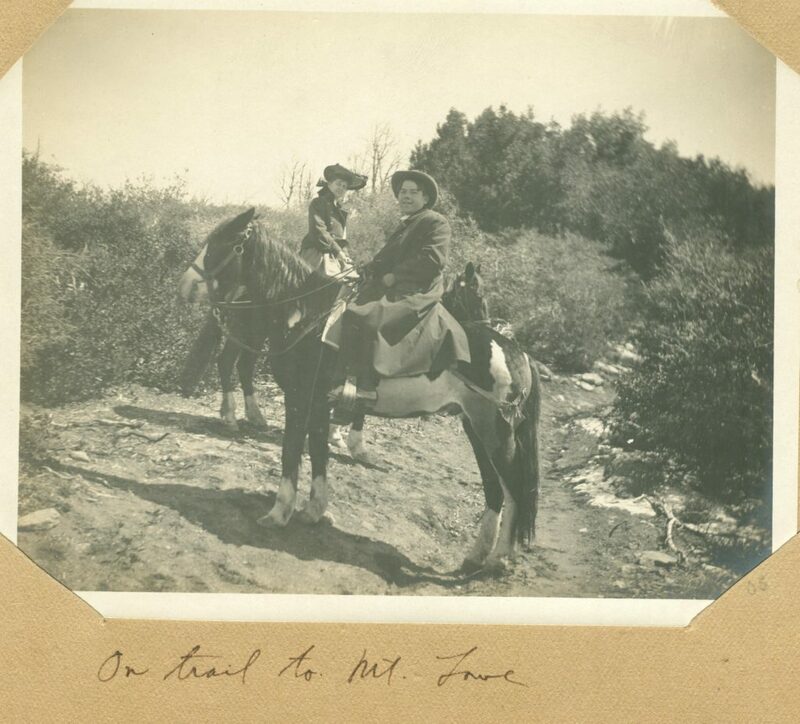 Guests were transported over the Alpine Division on a cold, clear December day to Alpine tavern, where they toured the tavern and its facilities, and explored Inspiration Point, where they had clear views of Echo Mountain House, Pasadena, and Catalina Island. At the opening ceremony, the chef and his assistants hoisted a large cauldron onto the crane of the massive dining room fireplace and the Tavern was officially declared open. A banquet, speeches and celebration followed. The dedication is fully described by Harrison Grey Otis,(Link to Otis article) the editor of the Los Angeles Daily Times, in John Sharp’s book, “Mt. Lowe and its Wonderful Railway,” published in 1898. 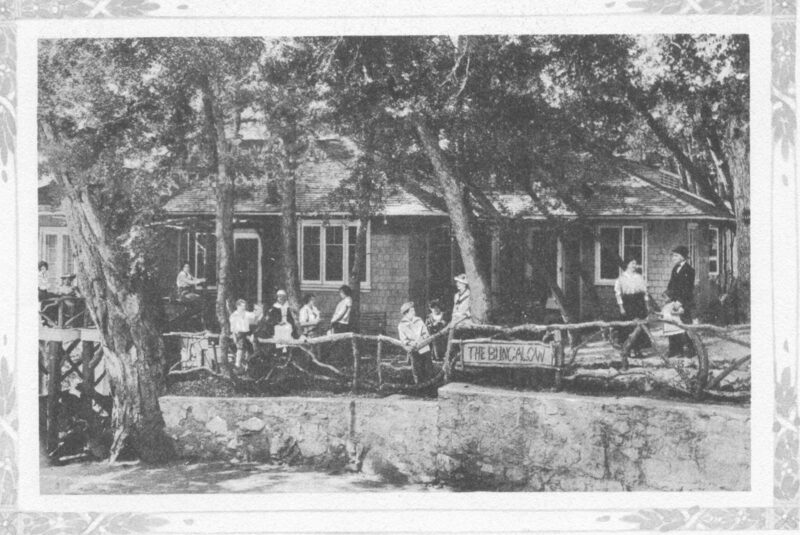 Guests at the tavern prior to 1915. 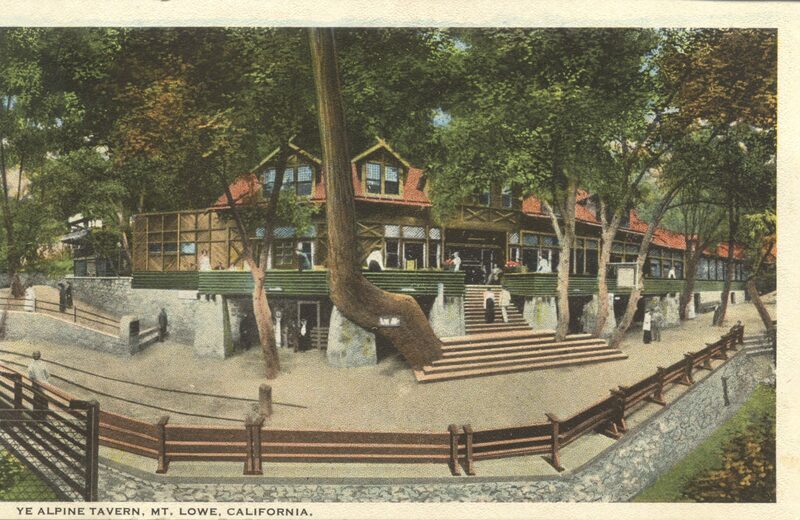 Professor Lowe lost control of Alpine Tavern and all of his Mount Lowe Railway holdings in 1897 when he was unable to buy back his properties after declaring bankruptcy. 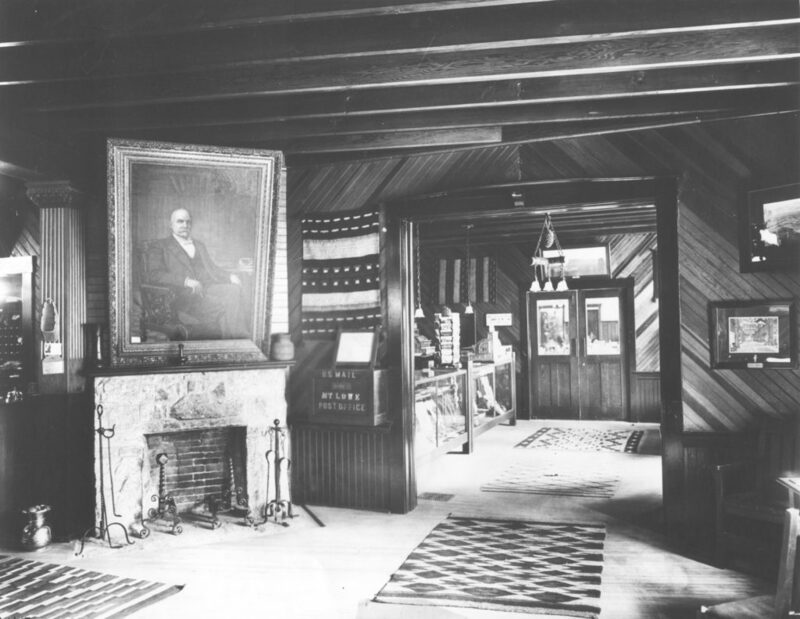 J. Sidney Torrance, who was appointed receiver after Lowe’s bankruptcy, changed the Tavern’s appeal from a resort that attracted wealthy tourists to a place for a day trip or rustic vacation for the emerging middle class. 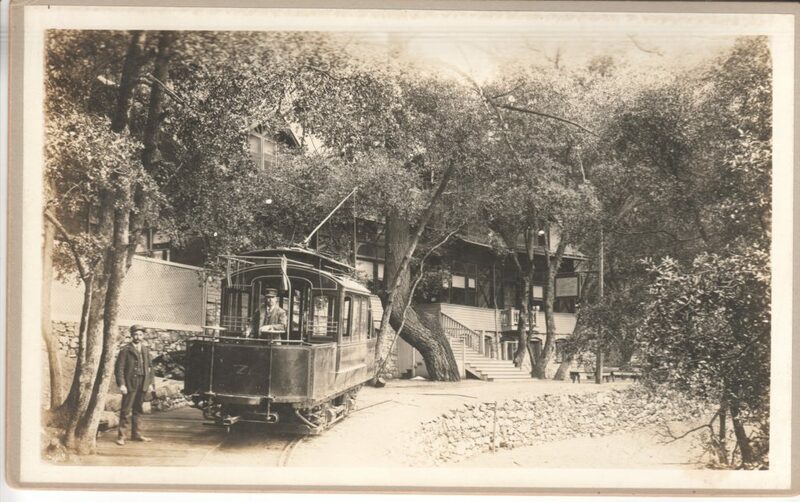 Valentine Peyton purchased the railroad in 1899, then sold to Henry Huntington’s Pacific Electric Railway in 1902, and Alpine Tavern was renamed Mt. Lowe Tavern. Two major additions were made to Mt. 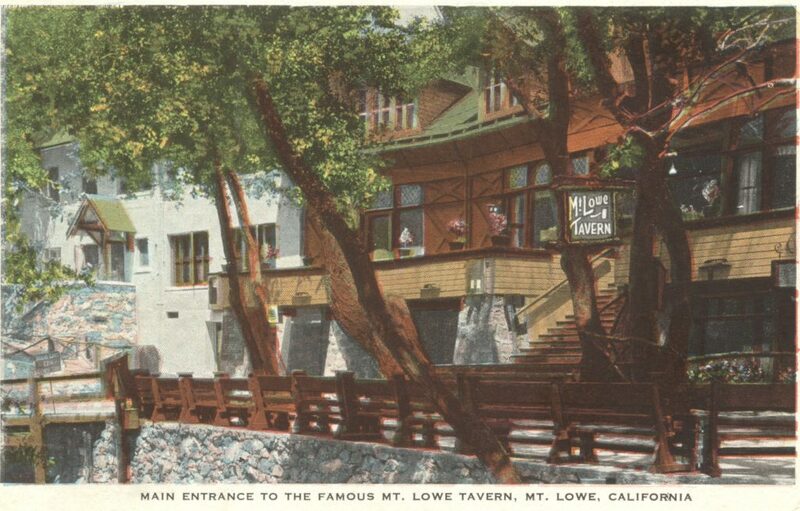 Lowe Tavern by the Pacific Electric Company. In 1911, at a cost of $13,000, the dining room was enlarged and a new maple floor added. Four bedrooms were added to the existing 12. Each bedroom now had individual lavatories for the convenience of guests. Twelve years later, in 1924, two double-story wings were added on each side of the original tavern, increasing the Tavern’s capacity to 185 overnight guests. The dining room and lobby were remodeled. 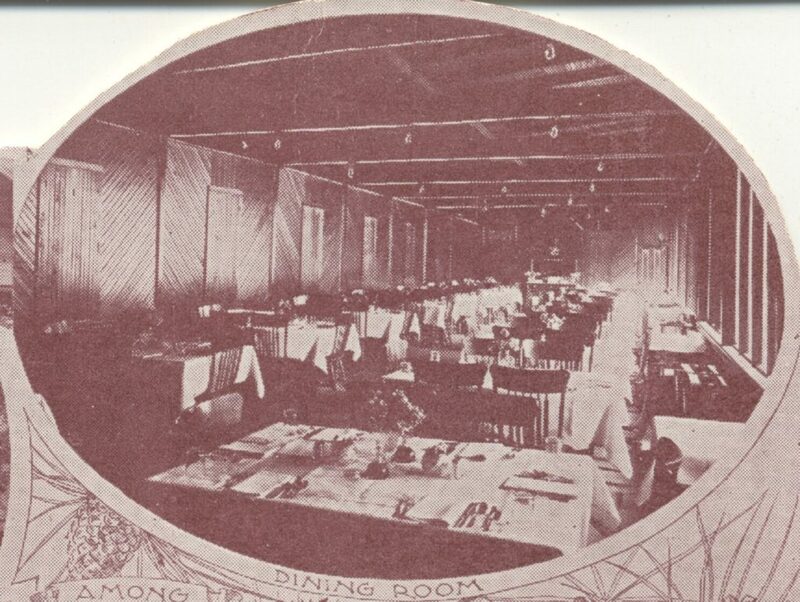 A dance hall/ballroom was added which could be converted to a dining room for banquets. The cost of the 1924 construction was well over $100,000. 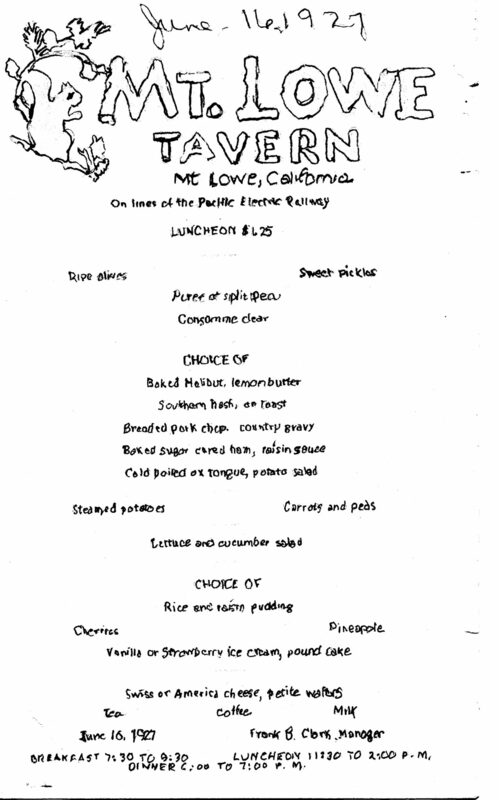 By the 1920’s, the tavern was no longer the destination of the wealthy; the Pacific Electric Railway advertised a trip to Mt. Lowe as a reasonably priced excursion. A round trip ticket cost $2 and took two hours from downtown Los Angeles to Mt. Lowe Tavern. Mt. Lowe became a popular destination year round, and had over three million visitors in its 41-year history. 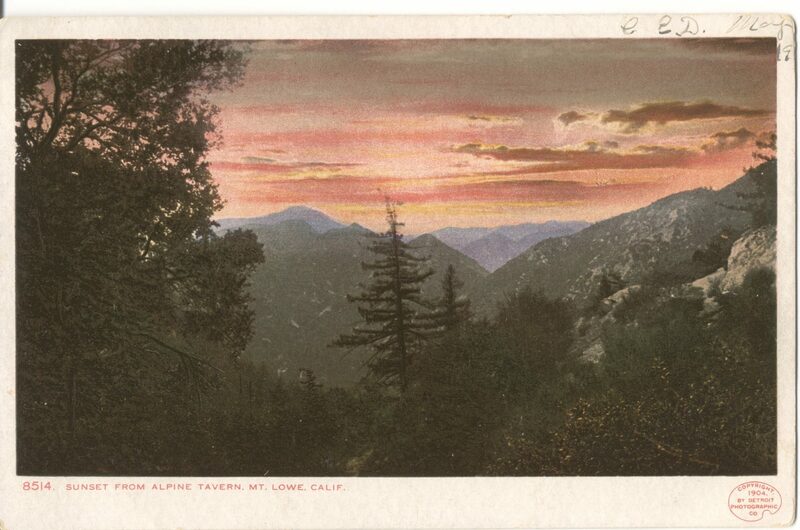 The Pasadena Evening Post reported in 1920 that “Alpine Tavern is a first class hotel open the year round. A good many people spend their vacation there. Others merely take their lunches or dinners at the tavern, if they are not giving more than a day to the trip.” It was a common practice for local papers to list who made the trip that day and to report the number of visitors. 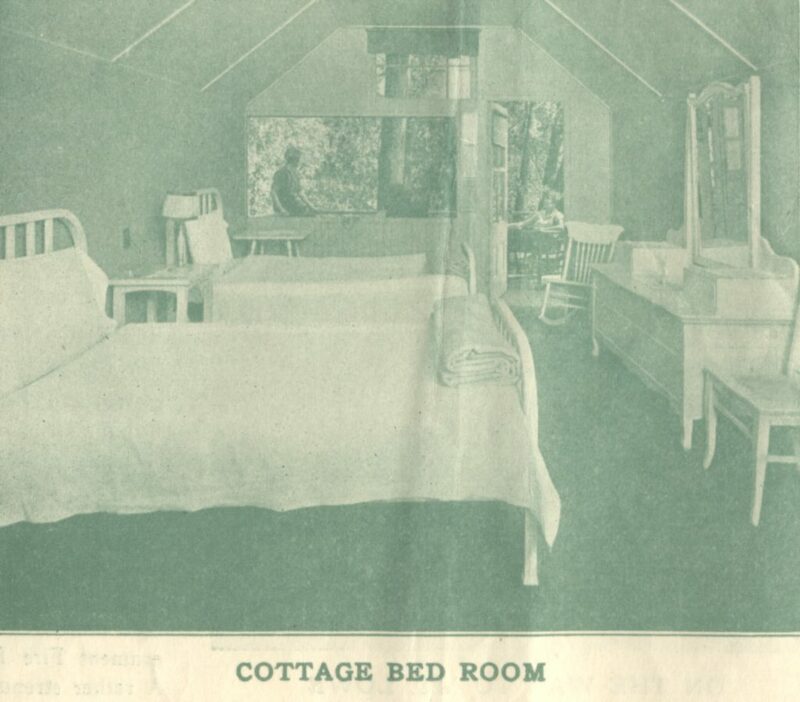 Cottage bedrooms were furnished in simple style. Guests could choose from a variety of overnight accommodations. If they wanted the experience of a fine hotel, Mt. Lowe Tavern rooms were $4 per night. A more intimate option was the Bungalow, located near the tavern, which had six guest rooms, five sleeping porches, three baths, electricity and hot water. 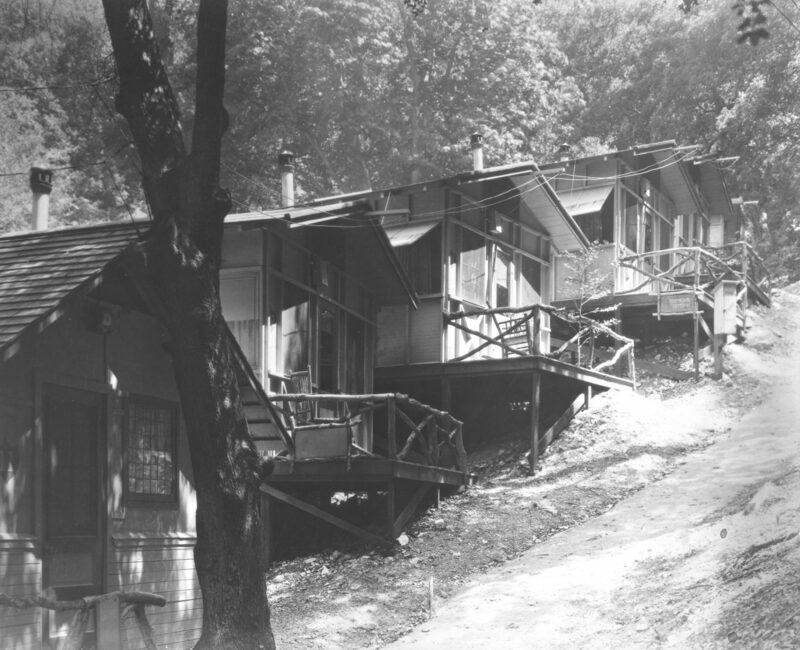 Forty housekeeping cottages, each with private porches, electric lights, comfortable beds, dresser, rocking chair, air-tight heaters, blue- flame stoves, dishes, cooking utensils, silverware and showers nearby were available for $15 per week. Tent cabins were provided for those who wanted a more rustic experience. Groceries were available at the small grocery story located in the tavern and a small shop in the lobby sold souvenirs. The dining room and all the recreational activities of Mt. Lowe Tavern were available to all guests, not just those who stayed the night. 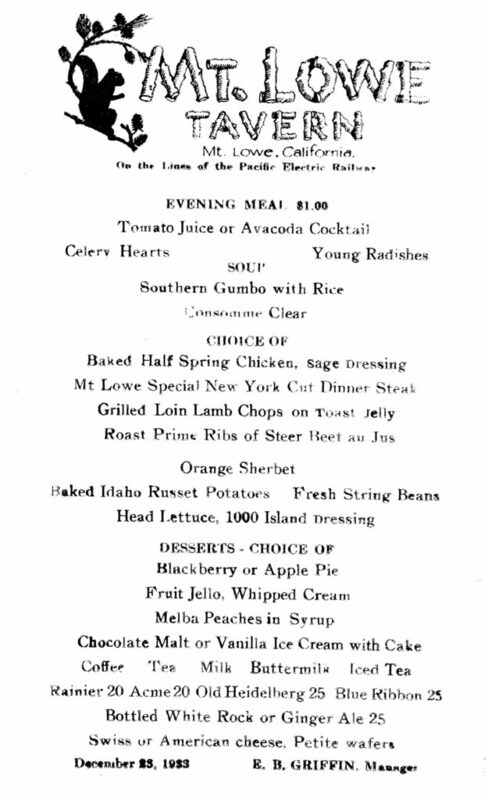 The dining room was informal, having no dress code and meals were served all day for reasonable prices. Breakfast cost 50 cents and lunch or dinner $1. The Mt. 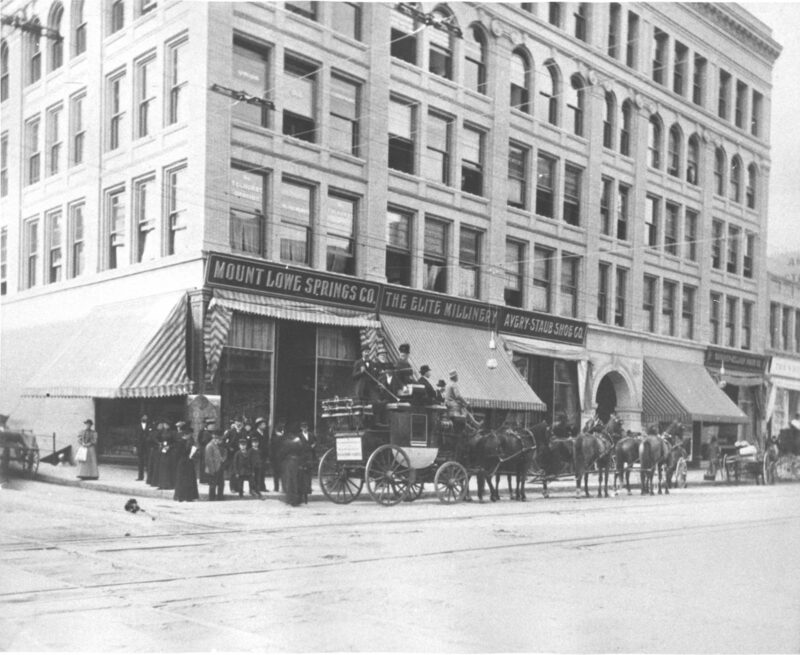 Lowe Daily News had its offices in the Alpine tavern building. 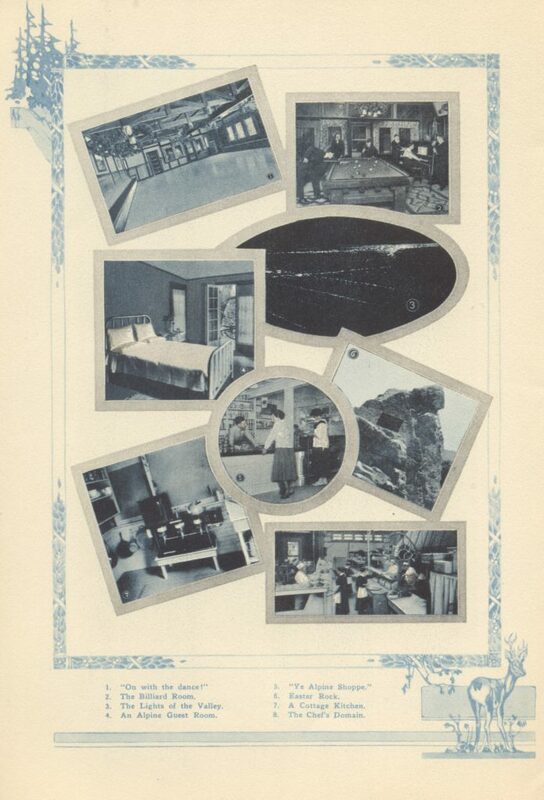 It was part tourist guide listing all of the available activities, filled with pictures of the various accommodations and amenities and also served as a Mt. 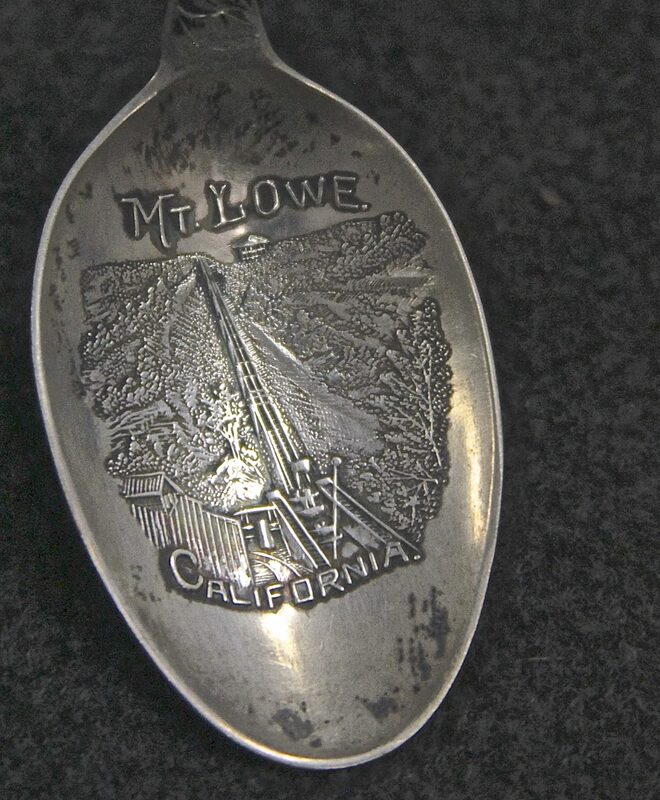 Lowe souvenir. The paper was published by Mr. L. G. Ury until his retirement and then by Wallace Meador until Alpine Tavern was destroyed by fire in 1936. Mr. Ury gave each visitor a card asking for their name and where they were from as they started their journey on the Alpine Division. He collected the cards and published a list of the daily visitors in the daily newspaper. At the end of the day, the Mt. 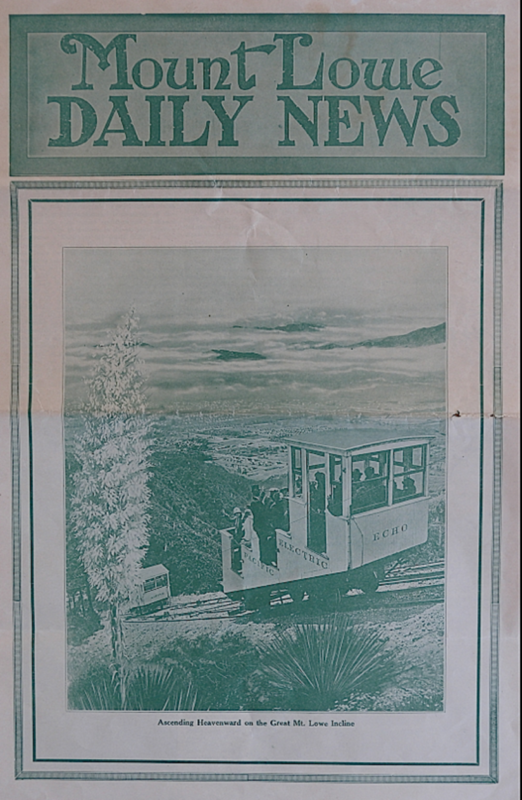 Lowe Daily News became a treasured keepsake for visitors. Alpine Tavern dance, circa 1930's. All ages danced in the Tavern ballroom. A beautiful view from Alpine Tavern. The fresh water from Crystal Springs, renamed Mt. 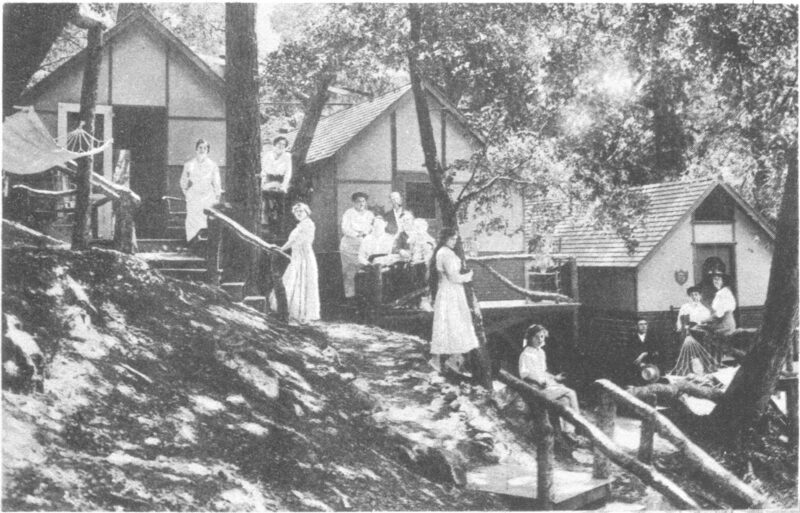 Lowe Springs during Lowe’s tenure, was enjoyed by all guests. Daily mail service, long distance telephone, and a daily newspaper were also among the guest services. Guests could rent mules or horses for $1 to take trail rides or spend the afternoon playing tennis. 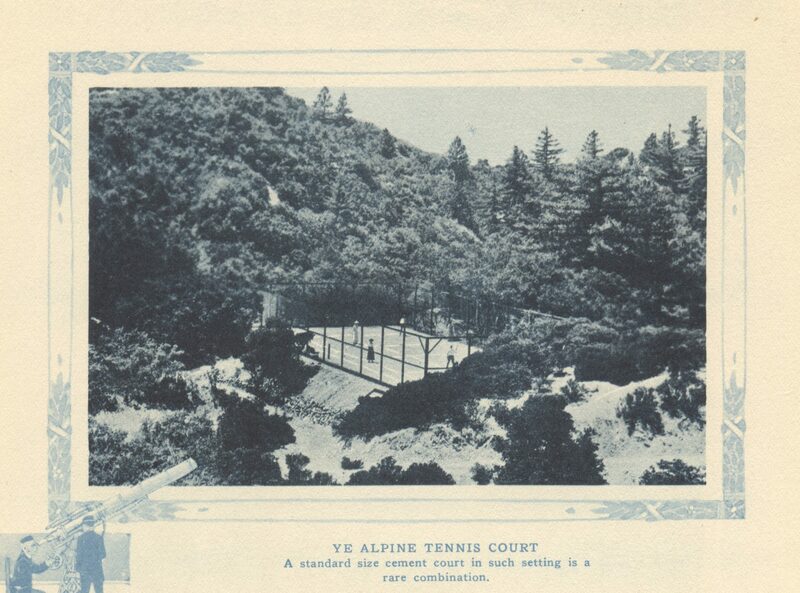 The courts were reported to be the best cement courts in Los Angeles. Picnics could be arranged and food purchased “at city prices” from Ye Alpine Shoppe, the small grocery store located in the main building. 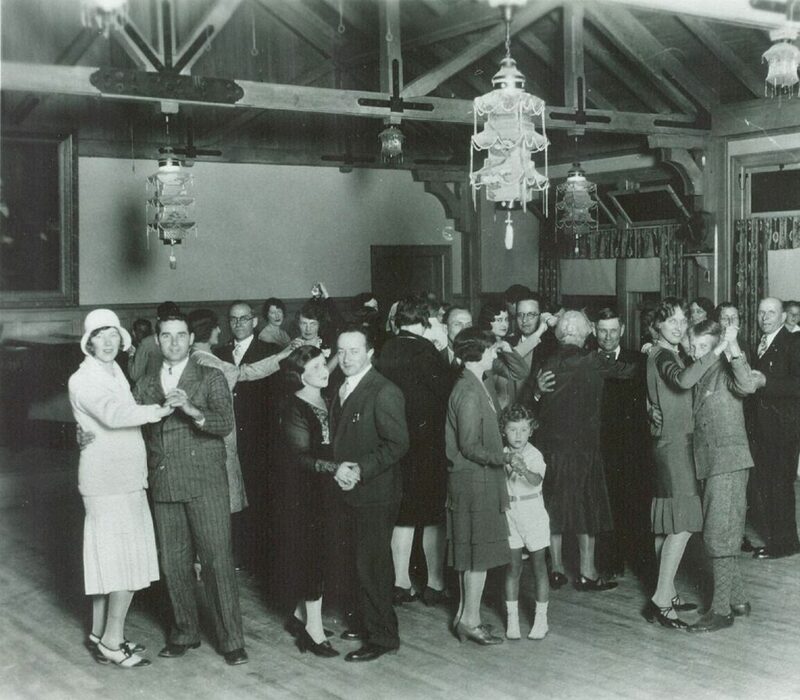 Dances were held in the ballroom every afternoon and evening. Guests could dance to music from a player piano or from Edison’s Diamond Disc Talking Machine. 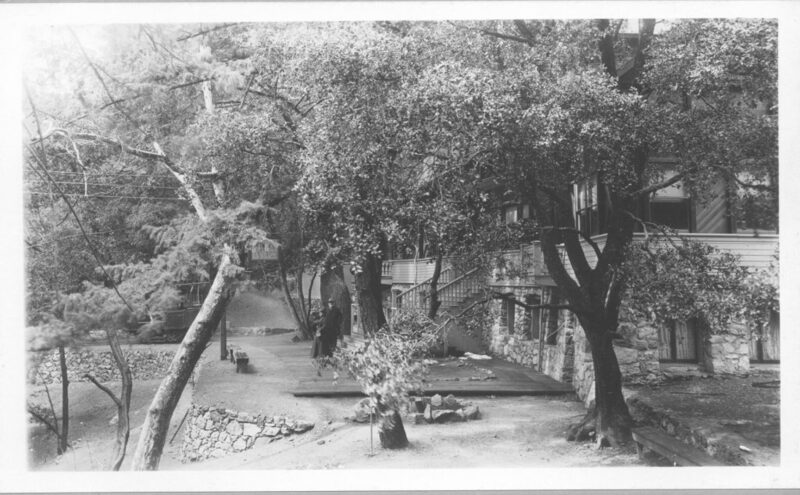 Pool and billiards were available, along with a circulating library. The dining room was readily available for reasonably priced meals. Shady trees and canyon rocks, along with porch rocking chairs, provided plenty of opportunity for visitors who were looking to just relax and enjoy nature.